아리랑TV의 “4 Angles” 라는 프로그램에 쿠르베스피커가 소개되었습니다. AI-powered smart speakers are now available for everyone, letting them simply speak a command to have their wish come true. Despite the new, convenient technology, some are continuing the legacy of analog speakers to present a one-of-a-kind auditory experience. 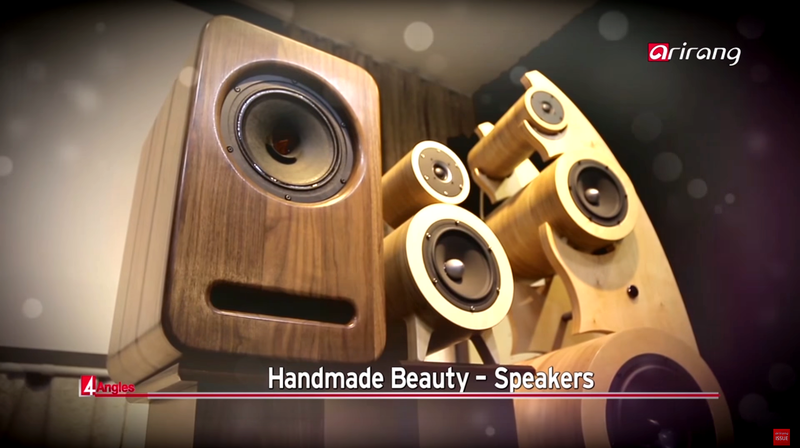 Let’s learn more about Korea’s handmade, analog speakers with Kim Yeon-seung, the owner of Courve. 평생 단 하나의 스피커를 꿈꾸는 이들을 위한 맞춤형 스피커가 있다. 맑은 울림을 위해 북유럽산 자작나무를 손으로 일일이 깎고, 원형의 링을 켜켜이 쌓은 울림통으로 소리의 왜곡을 최소화한 한다는 ‘쿠르베 스피커’! 장인의 손길로 ‘천상의 소리’를 전하는 수제 스피커만의 깊은 울림의 세계를 만나보자.